Alessandra and Eva both came up with a great idea - a weekly meme about your visits to the library. Now, they are planning on jointly hosting, and give that I am such a regular library visitor I thought that this is one weekly meme that I can definitely join in on. Having said that, I haven't been to the library this week at all! I did think that I would post the list of books that I have currently got out for this week and then from now on I will just post the week's details. I used to do a library crazy post on an irregular basis where I posted these lists, but I haven't done one for a while. and several books that are on request. Some of these have been on request for over a year so they may never actually come in, but some of them will. I really enjoyed snooping around your blog. Great reviews. Thanks for keeping readers interested in writing. Keep on reading! And stop by my web site if you have time and enter my book give-away contest. I give books away every month! My goodness, Are there any books left at your local library? Seriously I really enjoy your blog. All those books came from ONE library? That's amazing. Wow! That is a lot of books! I'm not sure our library would even let me check out that many. It's a great list though! And I thought I checked out a lot of books from the library. That's an impressive list. Guess what, Marg, I got a library card today! Well, I used to have one when I was in university, but it expired. Anyway, I can actually go to the library! Mind you, I am not going to get as many books as you because then I won't read all the books I own, but I can still enjoy it... I'm right excited! WOW: that's a lot of books!!! lol I'm not shocked, just impressed. Holy Mother of God, Marg. For what may be the first time ever, I'm speechless. I am shocked your library lets you have so many. But I bet they love you cause you're such a good customer. Holy books Batman! I would definitely recommend Loving Frank - a beautiful book. Hi Marg. I think there is a 12 step program out there for you---Holy Yikes! That list is amazing. How many do you think you will get read? I have Coraline sitting on the floor next to me just waiting for me to read it. I gave Sam, The Graveyard Book for Christmas--he has finished it and loved it! This looks like a wonderful weekly event! Marg, I gave you an award. That's even more than I have out Marg. My library lets me have 30 and I have 29. I ahve another 15 requested, then a "my list" for future requests of 82. Talk about being optimistic. Kerrie and Lezlie, I'm not sure what our maximum no. of books out is, but I haven't reached it yet. I do know that the maximum no. of requests I can have is 20, mainly because I reach that quite regularly! Kim, my problem is that I have too many 12 steps programs that I need to join - library, reading challenges, blogging and that's before we talk about food and Coca Cola! Wordjunkie, thanks for delurking and leaving a comment! Karen, I have borrowed Loving Frank for a group read. I am hoping to enjoy it. Carolyn Jean - well they don't charge me late fees on most of my books anymore so I think I must be on the high user list! Michele, I am sure you aren't completely speechless! Eva, glad you aren't shocked! Nellybelle, thanks for stopping by and leaving a comment. I hope you continue to enjoy my blog. Kailana, Yay! You got a library card. Reading the books I actually own is something I struggle with a little bit. Sandra, sometimes I wonder if the librarians are looking at me a bit strange when they are checking out yet more books but they don't ever say anything! Melissa, I think I mean to take some back. I mean really, I might have a big library problem! LOL! Actonbell, yep, all from one library. 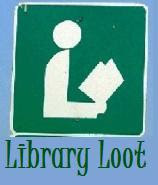 I am actually a member at a couple of other libraries but I am trying to avoid borrowing them except when they have something that my main library doesn't! Keta, thanks for stopping by. I will be over to check out your blog. Wow! I work at the library and I don't even have that many out. What I want to know is how you haul them all home and back? Holy smokes! That is two or three wheelbarrows full, at least. You must be a super fast reader. I'm envious. Booklogged, it doesn't seem like that many when you only bring 3 or 4 home at a time. Dana, I often wonder if the librarians get special rules for themselves! OMG! I can't believe you have this many out! Too funny. It's a problem that I have Jenny Girl! I can't seem to help myself. wow. Wanna here a funny story? I reserved and audio version Possession by AS Byatt and picked it up yesterday. I popped out a CD from the car's player and realized... I had cassettes NOT CDs for the book! UGH. So now that has to go back. I popped my music CD back in, the song came on and it was Pink's Stupid Girl. YEP! I can't believe I did that. LOL @ Bkclubcare! Don;t you hate that you then got sassed by the CD! My car has a cassette player but I don;t really like it because I have had bad luck with lots of the cassettes from the library being overused and distorted. Mostly I borrow CDs and then put them on the MP3 and plug it in using a converter. You weren't kidding! That really is a lot! I hope to get to that point though. I don't use my library near enough. This year for me is all about reading what's in my house. No buying, no library. That way I can read my pile and then go to the library! And now expressed in song! Play nicely this time Richard!